DONETSK, Ukraine -- Child soldiers appear to be playing a part on both sides of the conflict in eastern Ukraine. 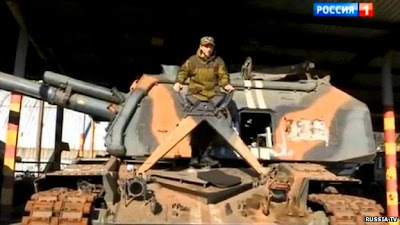 A soldier aged 15 poses for Russian TV on top of a tank captured from the Ukrainians. A boy as young as 15 has been shown training pro-Russian separatist recruits in how to handle weapons, while Ukrainian media have told the story of a 17-year-old volunteer sapper. It is a development that particularly worries the UN children's agency, Unicef, which is investigating "anecdotal evidence that children have been recruited and may be directly involved in the fighting". The fighting, which erupted in April, has claimed more than 4,300 lives and left some 10,000 people wounded. "Armed groups should not, under any circumstances, recruit or use in hostilities people under the age of 18 years," says the agency's Ukraine representative Giovanna Barbers. Early in November, Russian state TV carried a report about two "underage soldiers" serving alongside separatists in the rebel stronghold of Donetsk. Both are called Andrey and are members of one of the most widely-known rebel units, the Vostok battalion. As is common among fighters in Ukraine, they have their own noms de guerre - Royce and Stark. Royce leads a supply squad, while Stark is in charge of a munitions depot, official Rossiya 1 TV said. "Stark leaves his Kalashnikov behind only when he is on leave," it added. The battalion's commanders were like fathers to the boys now, the report said. "We need more guys like them and we won't be afraid of enemies. They are the future generation," said one Vostok commander. Russian TV did not specify the boys' exact age, but in an earlier interview broadcast on Finnish YLE television this year Royce said he was 15. He was shown flanked by two young men wearing balaclavas, one of whom claimed to be 17. Royce told YLE that he taught recruits how to handle weapons and move about on the battlefield. "I keep my eye on my trainees as if they were children," he said. A fighter with another prominent rebel unit, led by a Russian nicknamed Motorola, said he was serving alongside children as young as 16, according to Ukrainian daily Segodnya. The unnamed rebel told the paper that children were normally sent to training camps and were kept back from frontline combat. Under a UN definition, a child soldier is "any person below 18 years of age who is, or who has been, recruited or used by an armed force or armed group in any capacity", such as fighters, cooks, porters or spies. The UN Convention on the Rights of the Child prohibits the recruitment of soldiers under the age of 15. Ukrainian media were outraged by the upbeat tone of the Russian reports. "Children who were recruited by militants and are now ready to kill Ukrainians in Donetsk region are portrayed as heroes by Russian TV," said popular TV channel One Plus One. But other Ukrainian TV channels have featured a pro-Kiev child soldier, without questioning whether it was right for him to be involved in the conflict. Their reports told the story of a 17-year old who had spent two months in the conflict zone. For a week, he was a sapper at Savur Mohyla, the scene of extremely heavy fighting, one report said. Eventually, he was wounded and taken to hospital in central Ukraine. Speaking from hospital, he told 5 Kanal that he had lied about his age to enlist in a volunteer battalion. But his commander seemed to be aware of how young he was. "He always tried to be right at the front, he had to be kept back. It's not a person's age that matters here, but how prepared they are to fight for their country," he told Ukrayina TV, his face concealed by a balaclava. Some, however, are sceptical about reports of the involvement of child soldiers in the conflict. One Donetsk resident who claimed to live next to a separatist base told the Segodnya daily that he had never seen children there. "The militants like claiming that children fight for them because it makes them look cool," he said. Ukraine's year of chaotic events School is compulsory in Ukraine until the age of 17. Despite the hostilities, the education system in most rebel-held areas is still functioning and almost all children of the school age attend classes. Even Royce is reported to be doing his studies "remotely". However, in some cases, separatists have even taken to visiting schools to hold what they term "patriotic education lessons". There have also been reports in pro-Kiev media that children as young as 14 have been encouraged by the separatists to spy on Ukrainian troops. The direct involvement of children in the conflict is by no means widespread. But the chaos of war has meant that some have found themselves taking an active role alongside adults, and sometimes with their encouragement.